This first complete reprint of Boswell's book on Corsica since the eighteenth century is enhanced by comprehensive annotation, textual apparatus, and a critical introduction. 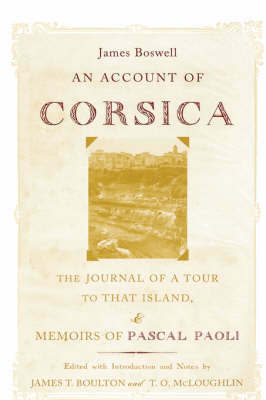 Boswell designed his text in two parts: first, an Account of Corsica, which gives a historical, political, socio-economic, and cultural overview of the Corsican people, and second, the Journal of his tour to see the Corsican leader Pascal Paoli in 1765. This edition, unlike so many reprints of just the Journal, allows the reader to appreciate Boswell's original design. The young and adventuresome Boswell wanted to write a book that would swing public opinion, and perhaps the British government, to support the Corsicans in their struggle for independence. He was well aware that his English readers had but the haziest ideas about Corsica gleaned from but snatches of news in the papers. The first part would therefore provide the context within which to understand and appreciate his account of his journey to and meeting with Paoli. The complete text also illustrates aspects of Boswell that have received less attention than they might, namely, his sense of history, his political enthusiasm for national liberty, and his scholarship. He brings to the book a solid foundation in the Classics and the law, a facility in French and Italian, and a sensitivity to writing that, as the notes show, is evident in the reworking of his manuscript. The editors' introduction and the extensive annotation point up Boswell the scholar-assiduous, sedulous to get at the relevant sources, careful to do justice to those he disagreed with, and open about seeking and acknowledging advice. The text reveals Boswell as a serious and independent thinker and a writer committed to Corsica's independence. What he argued for and presumed was about to be achieved is still a matter of debate in Corsica and metropolitan France.